Speechwriter career is neither a popular career set out by most young persons during their colleges nor by midlife career changers. But if you like working with both words and high-profile executives, it’s clearly an excellent alternative. There is no clear career path for career changers who aspire to choose speechwriter occupation. 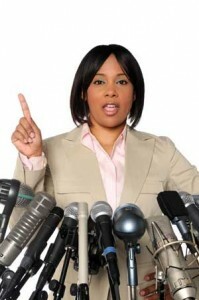 A career in journalism or public relations is a natural career sources for speechwriter career. One career changer stated that his reason for changing career from journalist to speechwriter is instead of reporting what others are doing, he writes for people who are doing things. If a journalist serves readers with news and information based on his/her medias’ editorial policies, a speechwriter serve his/her high-profile clients or boss based on their communications policies. Now, it depends on your career preference and goals. For younger persons, speechwriter career may become your fast-track career path. You’ll work directly with high-ranking folks who will help working your way up than if you choose a different career path in an organization. Working as a speech writer challenges you as a student or continuous learner. It needs regular updates of current affairs in your fields. The knowledge of the organization that a speech will be given is also essential. Speechwriters don’t write for themselves. They serve speakers — usually very busy, successful persons — who will deliver the message of the talk. To become a successful team, it’s better if you, as a speechwriter, work for someone you like and has similar values to yours. Writing for a speech is somewhat different compared to reporting news. Sentences in speech writing are brief and phrases are lively. Speech writers also have to take into account the speakers’ main vocabulary and their language strengths. In addition to researching the speaker’s styles a speech writer also need to learn about target audience. This includes interests, length of the talk and how the topic development. Both the writer and the speaker will work together on the goal and the delivery of the talk. For example, if the speaker want the audience to take action on a specific program then the speech is a persuasive talk. Or, if the speaker just want to tell the audience about a new policy then it is an informational communications. In short, a good speechwriter makes sure that the speaker can effectively communicate the main message to the audience. Speechwriters translate messages speakers want to say and target audiences want to listen. The writers do their communications stuff so that the speakers can focus on their important jobs. If your current occupation is closely related to writing and speaking it’s easy for you to change career to a speechwriter career. If not, you will need to start with an internship in the communications office.